Fiber plays a key role for digestion, weight loss, and cancer prevention, and can even increase lifespan! But don’t be fooled—many packaged food companies are trying to boost sales by adding extra fiber to their gummy candy or yogurt, but the best source of fiber is plants themselves! Yes, natural fiber is found only in fruits, vegetables, whole grains, and legumes. 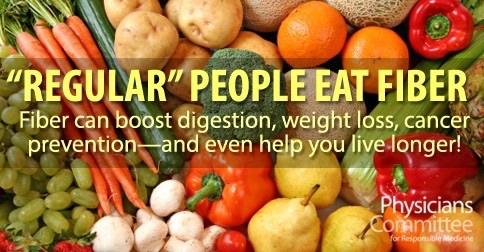 So make sure you’re filling your plate with whole, plant-based foods. There are two types of fiber: soluble and insoluble. Soluble fiber is found in oats, beans and other legumes, and some fruits and vegetables. Soluble fiber lowers cholesterol levels. Insoluble fiber—found in whole grains, fruits and vegetables, kidney beans, and bran—acts like a broom, cleaning your digestive tract. Both types of fiber are only found in plant foods—meat and dairy products contain no natural fiber. Don’t be fooled by yogurts that prominently advertise their fiber content! That fiber was added during processing. Since dairy products are high in saturated fat and cholesterol, skip the yogurt and head to the produce aisle. Just one cup of raspberries has 8 grams of fiber! 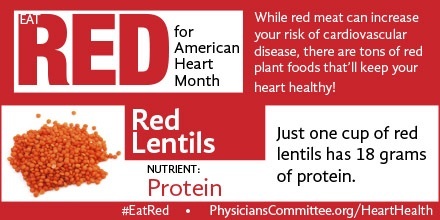 One cup of red lentils has 16 grams of fiber—and 18 grams of protein. If you’re looking to lose weight, filling up on fiber-rich foods is your best bet. My colleagues and I recently published a study in the Journal of the Academy of Nutrition and Dietetics showing that simply switching to a plant-based diet leads to significant weight loss, without any calorie counting or exercise. Not only can fiber help you shed pounds or relieve your digestive woes, it can decrease cancer risk. By improving the intestinal transit of food and waste, fiber helps your body eliminate carcinogens. The U.S. Polyp Prevention Trial also found that a high-fiber diet reduced the occurrence of colon polyps. A meta-analysis published in the Journal of the National Cancer Institute examined 13 studies and found that the risk of colorectal cancer decreased as fiber intake increased. How Can I Get Enough Fiber Each Day? I recommend a dietary intake of 40 grams of fiber per day—while most Americans are only getting 10-15 grams. But there’s no need to count. It’s easy to boost your fiber content with a few easy swaps. Trade white bread for whole grains. Ditch sugary cereals for heart-healthy oatmeal. Add some fruit to your breakfast or grab an apple or banana when you’re in a hurry. Make sure that everything on your plate has at least a little bit of fiber. Most importantly, skip the animal products. When your menu is plant-strong, you’ll be getting the fiber you need. Previous Previous post: Why don’t authorities advocate a sufficient reduction in cholesterol down to safe levels?